Although my review of Atrium Carceri’s Kapnobatai was positive, I now realize my trying to review an album in order to use it to discuss a haunt theme I had came up with ahead of time was not the best course of action. It would have been wiser if I had let the album itself give me ideas. 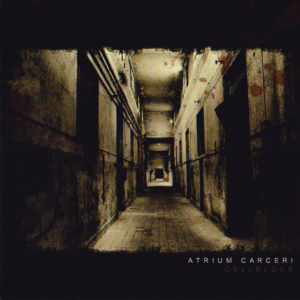 With that in mind, I started listening to the earlier entries in the Atrium Carceri discography. Choosing a single album to review was very hard but I ultimately decided on the very first album: Cellblock. The following review should make the reasons for this decision very clear. “Entrance” utilizes an effective synth buildup with some neat distortions, static and echoes. There’s plenty of other unnerving noises to be found in this, like breathing. It’s perfect if the entrance of your haunted attraction uses a dark hallway which leads further inside. Be sure to have a scare ready halfway through so customers waiting in line can hear the screams of those who went in before them without being able to see what caused all the screaming. Ambient outdoor sounds and crickets can briefly be heard in the opening of “Black Lace,” but can be easy to miss if you don’t pay close attention. It’s much easier to hear the sounds of wind and someone walking. Heavy synth tones are joined by a soft heartbeat and orchestration. The heart sounds increase later on and the sounds of locks being tested come in later. The overall effect is quite disturbing. The track “Machine Elves” takes its name from a type of hallucination often seen by users of DMT. This explains its unearthly tone. In addition to the sound of locks being checked, there’s chirping, bizarre electrical noises, rattling, and heavy synth tones. Bursts of steam come in later, along with a rock-like beat. You can use this in scenes like a haunted factory or alien room, but I suggest playing it in your mad scientist’s laboratory after adding a “Flesheater Tank” prop. The static sounds in the buildup of “Corridor” lead to a distant scream and distorted breathing. The ethereal vocals add to backing musical dark tones while the snippets of half-heard voices and laughter are most unnerving. The heavy tones and beat of “Blue Moon” reminds me of a heartbeat but its other parts remind me of steam and machinery. Between the sounds of things breaking and manipulated audio, you could use this in a haunted factory or industrial maze. Insect-like chirping and some briefly heard wildlife noises are mixed with beeping, bursts of steam and strange electronic noises in “Stir of Thoughts.” The orchestral touches in this are great too. Low, heavy beats open “Depth,” along with spacey noises. There are plenty of sounds the listener won’t be able to place, which should creep them out. There’s a masterful use of repetition along with the occasional burst of energy. I love what he did with the sound of someone gasping at the end. The opening of “Crusted Neon” features moody pulsing tones, metal percussive beats and echoing samples of people speaking in another language. There’s plenty of whispers, heartbeats and soft bursts of steam too! I think you can guess which sound effect appears in “Halls of Steam.” But it’s not the only effect on display. There’s also clanking chains, machinery and disturbing musical tones mixed in with the occasional wordless vocals. In addition to steampunk haunts and Hellraiser scenes, this would be perfect for a room filled with dangling chains and other surprises. “Reborn” starts off soft and with a sample of someone saying “he’s been strangled.” There’s plenty of moody backing tones and eerie music. In addition to the gust of wind heard at one point, there’s also the sound of a heavy door being unlocked and footsteps. Static and electrical crackles form the beat of “Red Stains” and are later joined by steam exhaust. There are lots of other sinister little touches as well. This has so much scene potential! “Inner Carceri” closes things out and its sense of desolation is downright overwhelming. The sounds of metal being struck are peppered throughout and other sound effects reminded me of something scrabbling or squirming about. These are definitely not what you want to hear in a supposedly abandoned building. First released on the Cold Meat Industry label back in 2003, the original Cellblock CD is long out of print. Thankfully Cryo Chamber has recently made it available again and is planning on doing the same for other entries from the Atrium Carceri back catalog. The only differences are how the reissued version comes in a 6 panel cardboard digipack rather than a jewel case and the cover art seems to have a slightly different use of contrast. In other words, nothing worth getting worked up about. Cellblock is oozing with atmosphere and I urge anyone reading this to grab a copy. As the title suggests, it can work in a haunted asylum or prison (especially one made to look like it’s in such a state of disrepair that nature has started to reclaim it) in addition to any haunt scene where you want people to feel darkness and isolation. Every one of its tracks is well-suited for individual looping and you can also loop the entire album on Halloween. Although you might want to play it softly to disguise the occasional samples if you chose the latter. If you choose to do the former in your haunted house, then I have one last scare tip for you. In a section designed to look like there’s a crack or gap in the wall, place a mirror behind it. This creates the illusion of something moving inside whenever people pass by it. This is sure to creep out anyone who notices and is a great way to add an additional scare when performers are in short supply. It’s also handy on a low budget, since old mirrors can be obtained cheaply. Sometimes you can even get them from craigslist’s free section. Either way is great since you can now use the money you saved to buy more Atrium Carceri albums! Special thanks to Atrium Carceri for use of the image!